Advocacy Initiative: Local, County, State and National industry issues monitored. Proactive approach to promote, defend or mitigate legislated or regularity actions. Business Networking: We offer a variety of activities and special events such as the trade-show & education conference, the annual golf outing, happy hours, family friendly events and more (full event calendar HERE). Professional Education: National designation programs (CAPS, CAM, CAMT, CAS and NALP), industry education (fair housing, leasing, affordable housing, and more), certification programs, and the online university. NAA Click & Lease Forms: Authorized re-seller of the most widely accepted standard of legal documents in the industry (Bluemoon). This includes student-housing lease forms and more. Affiliated Services: When you join PMA of West Michigan, you automatically become a voting member of PMA of Michigan (PMAM) and the National Apartment Association (NAA). This federation represents over 170 state and local affiliate associations with 67,000 members responsible for more than 7.6 million apartment homes throughout the United States and Canada. Wow! Business Development: Many advertising opportunities, committee involvement, national suppliers council, industry resources, public relations services and social media connections! Professional Development: In addition to committees, programs and special events, being part of the association helps build solid relationships and long-term friendships with others in the industry. Community Service: We have a long-term commitment to assist the needs of the American Red Cross of West Michigan (Donate NOW here) and we plan to introduce some additional community service options in 2016 and beyond! Communications & Market Data: New and improved bi-monthly local publication and directory, industry specific alerts, NAA Units Magazine (a National publication), quarterly market data reports and wage & salary data. ​Professional Discounts: FREE Apartment Availability Listing, FREE Market Survey Program, discounted Job Postings, Resume Bank, office supply discounts, NAA Open Door Program and more! 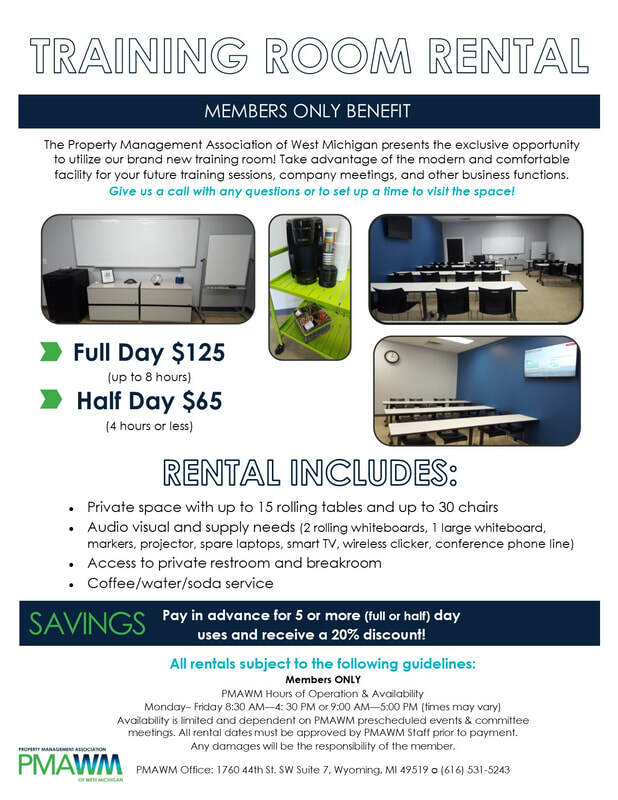 Training Room Rental: Members have access to rent our modern training room for their next staff meeting, education training and more! Give us a call to reserve!